I read a post tonight and it got me motivated. Not enough to start it this minute as it will probably take days or even weeks to get done, but I do need to get started somewhere. See I have to schedule everything around my health, mainly my Fibromyalgia which can mess the best intentions up. I can literally make 100 or more outfits without any of the items being reused other then the bottoms. That isn't counting the clothes that don't fit me. To be honest I still have clothes from when I was in High School, and even though my oldest child is now 25. Some of the clothes are as old as he is. No joke. So after reading this blog post from another blogger I really need to get on the ball and go through my clothes. I won't even go there with my children's clothes, or heaven forbid my husband's clothes. 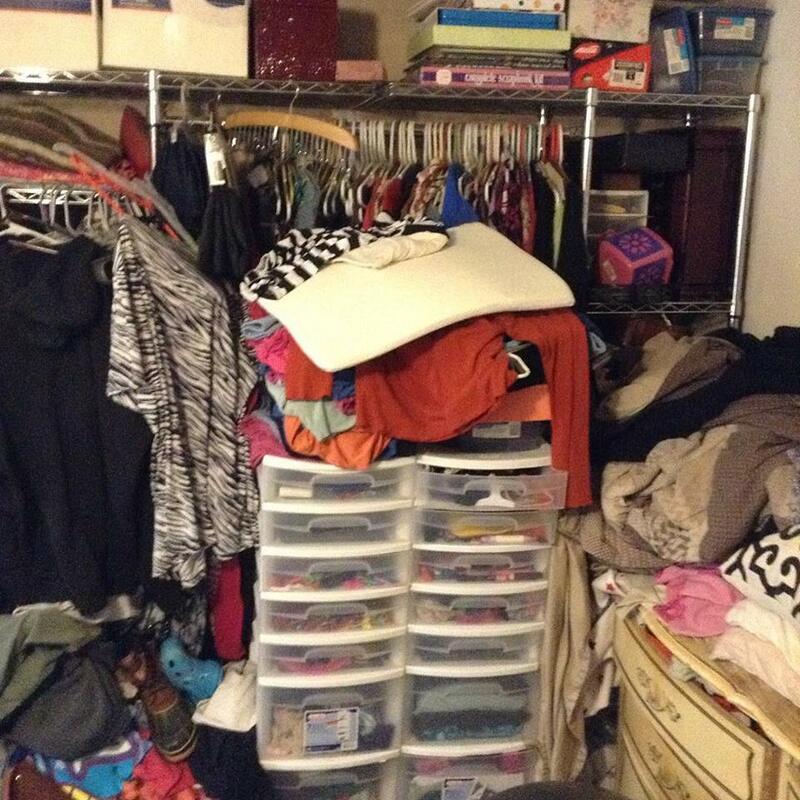 We need a complete makeover for all of our closets. 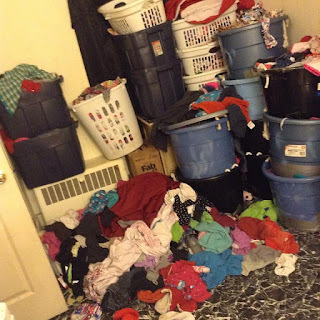 One look at my bathroom/laundry room and the wall of clean clothes piled up in baskets that almost reach the ceiling that I haven't folded, that the kids have to look through to get clothes because I don't have the energy to actually fold and put it all away before they go tearing through it all for their favorite shirt. 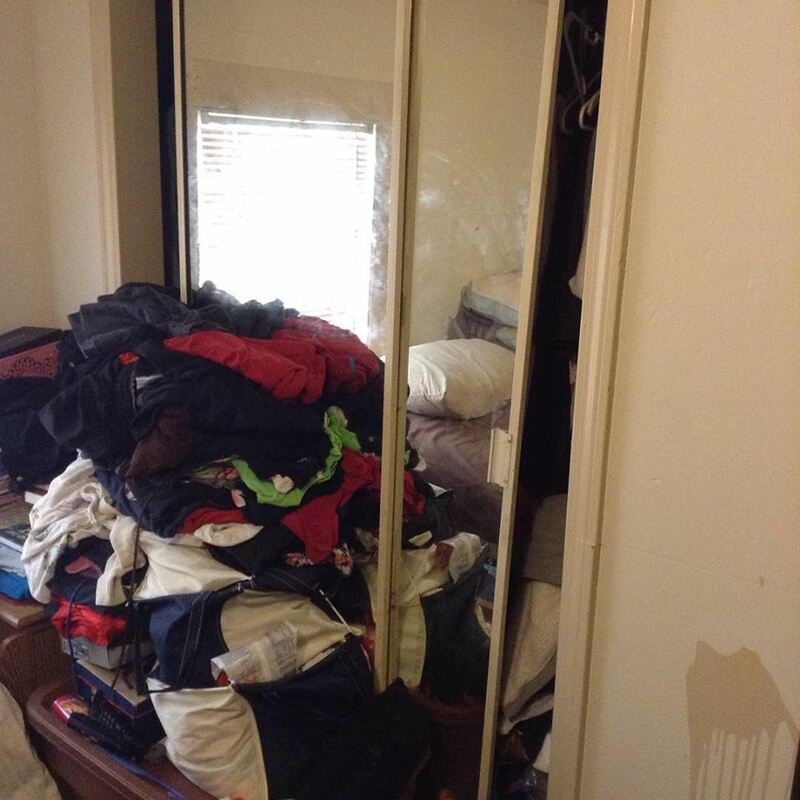 As for my husband's and my clothes, well they are overflowing out of the closet, stacked on the dressers, as well as over filling the dressers. 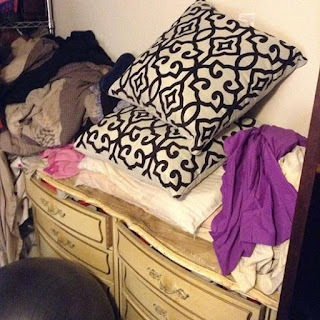 I will attach a picture of the before below and then do several other blogs later showing just the work on our clothes alone and if I still have the motivation I will do the girls clothes of course with their help, to at least make it a little easier on myself. I do know how all of the started with clothes at least for me. I grew up only having a few outfits because my family just could not afford clothes. So as a teenager I had a small income from babysitting neighbors children so I would hit the clearance racks as well as a place called the Purple Barn that sells used clothes near us while growing up to fill in and take over where our family couldn't afford. This started when I was about 12 years old. We tell our children all of the time how blessed they are to have so many clothes to choose from. When my husband moved from his mother's to our home before we go married he literally moved in with one milk crate, yes the kind that holds 4 gallons of milk. That is all he had for clothes besides what was on his back. So he too when we had our own place got on the clothes wagon because even though he had clothes he never really had much. So between him and I and then our 6 children we kept getting clothes. Yes I reused clothing from one child to the next but it didn't stop us from hitting great clearance sales and buying more when what we really already had was quite enough. So everything snowballed into what we have now. I have to come clean in another area of our life too, half of our basement is filled with rubbermaid totes of clothes that are either too small or clothes for my daughters to grow into from their older sisters. I have saved the smaller clothes for my two granddaughters and even the baby clothes for future grandchildren. I will post pictures of this when we get to this. We are not quite hoarders just the kind of people who want to be prepared and overly in some cases. I have let go of all of our clothes for our boys unless there are a few we missed down in the basement because both of them have moved out and are on their own. Girls seem to run more heavily with our family and dresses never really go out of style so we hung onto all of those. I even saved shoes of different sizes each size in their own tote. As you can read, we really need to thin out our basement, dressers, closets, and life. We aren't getting any younger, my health isn't getting better, and our clothes are starting to swallow us up. So join me in the days and weeks ahead on the journey to clean out our closets and take back part of our lives. I want to be clear that before I worked outside of the home or came down with Fibromyalgia you would never find clothes around the house like this. This is one reason I have decided to get the family on the band wagon to cut back on what we have.